Salvaging is breaking down equipment into materials. This can only be done via the Blacksmith's interface. All normal (white) magic (blue), rare (yellow), set (green), and legendary (orange) items can be salvaged for materials which are required for crafting recipes and enchanting. In D3v there were four different versions (tiers) of each type (save legendary) crafting materials, one for each difficulty level. In D3v2 and RoS there are only two tiers, each with five types of crafting material, sorted from level 1-60 and level 61-70. In D3 there are 4 different salvaged materials, plus one yellow material that can only be found from Elite drops. All salvaged materials can also be found dropped from monsters, chests, goblins, and often Horadric Caches. Orange material can only be dropped by Rift Guardians. Salvaging items in D3v sometimes returned more than one type of material. This is no longer the case and in D3v2/RoS each item salvaged grants only a single type of material, though white and blue items will grant more than one material each. White items yield 2-8 materials. Blue items yield 2-4 materials. Yellow items yield 1 material. Orange / Green items yield 1 orange material. Reaper of Souls adds a second tier of materials, for items from lvl 61-70, and occasional drops as well. See the Materials article for more details. The salvaging interface is very easy to use. 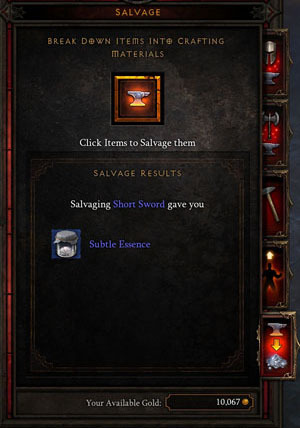 Characters need merely speak with the Blacksmith, select the Salvaging tab, then click the salvage icon. This transforms the cursor into a special salvaging pointer, which with instantly salvage any white, blue, or yellow item left clicked upon. Set and legendary items pop up a confirmation box before salvaging). Players can salvage multiple items in rapid succession by clicking quickly, but beware -- salvaged items cannot be recovered. Unlike the buyback option for sold items, once an item is salvaged, it is gone forever. If a socketed item with a gem is salvaged, the gem will be returned to the inventory once the item is destroyed. This is often much cheaper than unsocketing a gem from an item, and the player also gets a small material return for crafting. Items purchased from NPCs can not be salvaged in D3v2. This can be inconvenient if a gem has been placed in the item which was intended for short time use and then disposal. Salvaging is free, though items can be sold to NPCs instead of salvaged, and level 70 items fetch a good price in Reaper of Souls. Rares generally go for 4-6k, but crafting requires so many Veiled Crystals that most players wind up salvaging almost all of their rare items, even if they could use the gold for the sales. This page was last edited on 18 April 2015, at 23:38.